For the second year running, The Watson is proud to have partnered with the Helpmann Academy in support of their Graduate exhibition which runs until 12th March at Drill Hall, Torrens Parade Ground, Victoria Drive, Adelaide. The Watson is an award that provides a budding graduate artist with $7,500 to further their career in the arts, as well as the opportunity to have their work hung alongside Tommy Watson’s at The Watson in Walkerville. ASHG: The Line was inspired by the peaks and troughs of life. Have you had any notable peaks and troughs that you are willing to share? Is this a common theme in your work? KATE: Various elements within my teenage years and early twenties bred an atmosphere of sheer dysfunction. As the years passed, it became increasingly difficult to stay on track and to nurture a healthy relationship with both myself and with my outlook for the future. This chaotic environment eventually stopped me in my path, forcing me to reassess, heal and begin again. It is due to this that my work throughout 2016 and most prominently The Line circled around themes of self-reflection, growth and optimism. ASHG: How have Helpmann Academy supported your journey? KATE: Being selected to exhibit within the Helpmann Academy’s Graduate show was a very exciting and important step within my career development. It is an opportunity to be supported and given a platform to reach a wider and in some ways, more prominent audience. Without their involvement, mastering something like that would be a terribly difficult feat at this stage. ASHG: What do you feel The Watson Award will enable you to do that you may have otherwise not had the opportunity to do? KATE: For me, being selected to receive The Watson Award marks a huge achievement in my life and the door open to many new and exciting opportunities within my career. My works often revolve around themes that are exposing and personal in nature, which is a very vulnerable position to be in. So to open myself up in that way, and to receive such a positive response and acknowledgement that people can hear me is an incredibly strengthening and warming experience, particularly when I have had such difficulty in doing this in the past. Secondly, the strong foundation that I now find myself standing on will enable me to truly focus on my craft and create new bodies of work that I had always dreamt of doing, but had been limited by both time and financial restrictions. ASHG: You say that your dream is to make large installations. What has the driving inspiration been behind this? Where would you most like to see one of your works placed? KATE: My two loves are art and music. I have always cradled them separately, trying desperately to give them the attention and nourishment they require. The idea of having these two loves meet has always created a stone of anxiety in my belly, in fear that they won’t get along. However in the last year or so I haven’t been able to escape this thought and I have decided to harness my fear and give it a real shot. I dream of combining these two forces to create large installations that one could enter and find themselves completely submerged. Having the support of The Watson Award under my belt has made this dream a very plausible reality, which is extremely exciting. I would love for my work to one day travel the seas and make connections all over the world - being shown in The MoMA would be a dream! We also took this opportunity to catch up with 2016 winner, Emmaline Zanelli, to find out what she’s been up to in the past year and how The Watson award has helped her reach new heights. ASHG: What have you been up to in the past year? 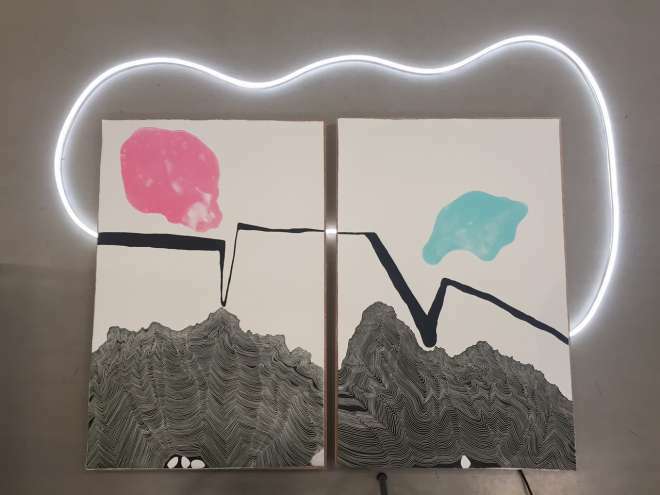 EMMALINE: Over the past year I have taken part in my first 2 interstate exhibitions; the HATCHED: National Graduate Show at PICA in Perth and a solo exhibition at Stills Gallery in Sydney. I also took part in 6 shows in Adelaide throughout 2016, won the Adelaide Review Young Artist Award at the 2016 SALA festival, 3 of my works were acquired by Artbank and I got a studio space at Fontanelle in Bowden, where I am still working from now. It’s been a BIG year! ASHG: What has The Watson Award allowed you to do that may have not otherwise been possible? EMMALINE: I was able to buy my first digital camera and speed lights! This had a profound effect on my working process and certainly accelerated my practice. I was able to push my use of the image in new ways and work quicker in the experimentation periods of work development. The award money also flew me to Perth to attend the HATCHED show where my work was showing. It was an incredible experience to meet other emerging artists from around the country. It was very influencing to see so many other passionate emerging artists across so many disciplines, and also to have the experience of meeting and working with the staff at PICA. The money also allowed me to re-print and frame my work for the National Grad show at the size I hoped it to be originally but could not afford at the time before winning the award. This meant a lot to me. It also paid for the first 4 months of studio rental at Fontanelle, giving me the space I need to create. ASHG: In one short sentence, what do you love about being an artist? EMMALINE: Learning in a way that makes sense to me. “Whatever you paint, whatever you write, it’s not the starting point, it’s in the building of what it becomes”. Charming and understated, Adelaide is the reliable girl-next-door when it comes to local culture. But don’t be dissuaded by the less showy approach to city life; Adelaide can run with Melbourne and Sydney when it comes to food, wine and all things art. Here’s our picks for big and small kids alike. On Friday and Saturday evenings, the high tea salon Fancy Nance, located just around the corner of The Olsen, will be transformed into the Zumbo Dessert Bar, featuring a rotating line up of Melbourne DJs, a cocktail menu and a soft serve machine – part dessert, part disco.